We are a competitive and recreational swim team for ages 5-18. Our coaches are positive and supportive of all levels of swimming. Bulldog Swim Club is a year round USA swim team that is designed to expose kids to friendly competition and the camaraderie of team meets. Emphasis is placed on stroke technique and developing children and teens who wish to improve their swimming and racing skills. Practices are offered 4 – 5 days a week so that families can have a flexible practice schedule. Competing in USA swim meets is encouraged but not required. Whether you are coming from a competitive swimming background or are new to swimming we have something for you. We are a small team and our coaches give a lot of personal attention and technique advice. Try us out for free! Click here to schedule your appointment! Meet our coaches, show us your swimming skills and find out which group would be best for you. No commitment necessary – just try it out & see how much fun swimming can be! For more information please call us at (650) 378-7383 or email us at smac.aquatics@smccd.edu. Jim has taught and coached swimming for over twenty-five years and has been a member of the SMAC aquatics coaching staff since May 2012. Jim leads our staff of seven coaches and is looking forward to working with kids of all ages and abilities as they seek to improve their swimming. At the age of nine Jim began swimming competitively for the Golden Serpents Swim Club in Michigan. He has remained in the sport ever since. Jim began coaching in 1984 at the University Club in Lansing Michigan and began officiating swimming meets after graduating college. He’s been competing, coaching and officiating ever since. Jim loves coaching and enjoys working with entry level swimmers focusing on building a solid stroke and technique and developing a foundation that will serve athletes over the course of their swimming career. Prior to joining the staff at SMAC Jim helped athletes develop at Mavericks Swimming team in Half Moon Bay, the Burlingame Country Club, Carlmont High School and Half Moon Bay High School. Eric grew up loving soccer and swimming. He began swimming competitively in high school. 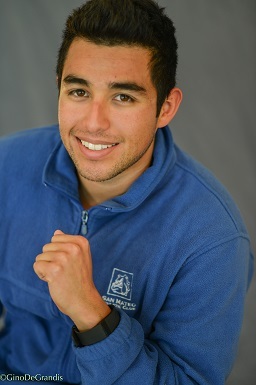 He swam three years at Burlingame High School and swam two years for the College of San Mateo Bulldogs. Eric continues to swim 4 times a week with our San Mateo Masters swim team. Eric began teaching swim lessons since he was 16. Eric’s favorite events are the 200 freestyle & the 100 Breaststroke.